"Tomatoes, onions, and cucumbers (yes, cucumbers!) 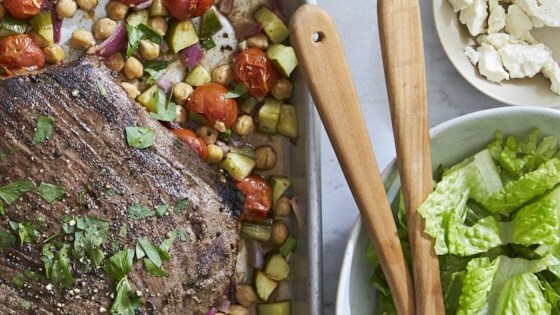 roast along with the steak, creating a crunchy, juicy salad that just begs to be topped with feta." This was a delicious dish!!! The only thing I changed was I swapped out the cucumber for celery and zucchini-much better veggies for roasting. Regardless, we will be having this dish again! You don't think it works, but then it works with the roasting of the odd ball veggies. I stayed true to the recipe and enjoyed a great warm salad. I've made this several times with venison and have even made the cooked vegetables by themselves. Who knew you could cook cucumbers? Ok I must admit that I thought the cooked greek salad sounded weird but it was so tasty and heated up just fine as left overs. Easy to make and clean up.